I would like to introduce you to Fugly – our mooing car (and yes you read it right, our car moo’s like a cow!) Fugly is a Fiat Multipla, a car world-renowned for being ugly and affectionately know as a Fiat Ugly or an Ugly Bug. Ours also has a rather quirky registration number F***GLY – hence the name Fugly or it’s street name The Fug. It is the most recent acquisition in a long line of attempts to buy a road worthy 6 seater car for tuppence ha’penny and it is in this car, along with our trusted trailer, we are going to attempt our epic journey through France. In case you’re in France between 23rd July and 8th August we will be easy to spot – an ugly silver 6 seater car with daisy stickers on it overflowing with testosterone ridden teenage boys pulling a tatty trailer covered in cycles. Oh and did I mention it moo’s? Give us a wave if you’re feeling brave enough! 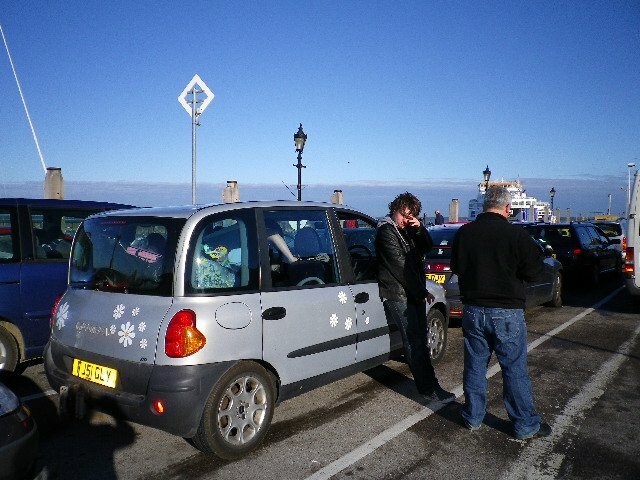 This entry was posted in Adventure, Camping, Cars, Family, Fiat Multipla, France and tagged Fiat Multipla, France, mooing. Bookmark the permalink.